What SAT and ACT Scores Do I Need? According to surveys by the National Association of College Admission Counselors, admissions officers routinely cite SAT and ACT scores as one of the most important factors in admission decisions, so it’s no wonder that students stress about the SAT and ACT. Students everywhere worry about what SAT or ACT scores they need to get into their dream colleges. SAT and ACT Scores: What scores do I need? Colleges have different approaches to SAT and ACT scores, so there’s no simple answer to this question. While many colleges require students to submit test scores, others are test optional or test flexible. Test flexible schools are schools that allow students to submit other college-level tests, such as SAT Subject Tests or AP exams, in lieu of SAT or ACT scores. These schools include New York University (NYU), the University of Rochester, Drexel University, Middlebury College, Colby College, and Hamilton College. Test optional schools are schools that don’t require students to submit SAT or ACT scores or that use those scores for placement rather than as part of the admissions process. This group of schools includes some pretty prestigious universities, such as Wake Forest University, George Washington University, Smith College, Wesleyan University, and Bryn Mawr College. 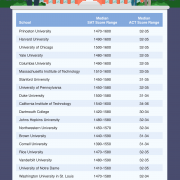 Among colleges that require SAT or ACT scores, the range of acceptable scores varies widely. Most colleges report the middle 50% of scores for the previously admitted freshman class, which means that you can see how the middle 50% of admitted students scored. Keep in mind that ¼ of accepted students will have scored below that range and ¼ will have scored above that range, so the middle 50% range does not tell you exactly what score you would need in order to receive an offer of admission. Our favorite source for ACT score data is the National Center for Education Statistics College Navigator, and the best source for SAT score data is the College Board’s Big Future. 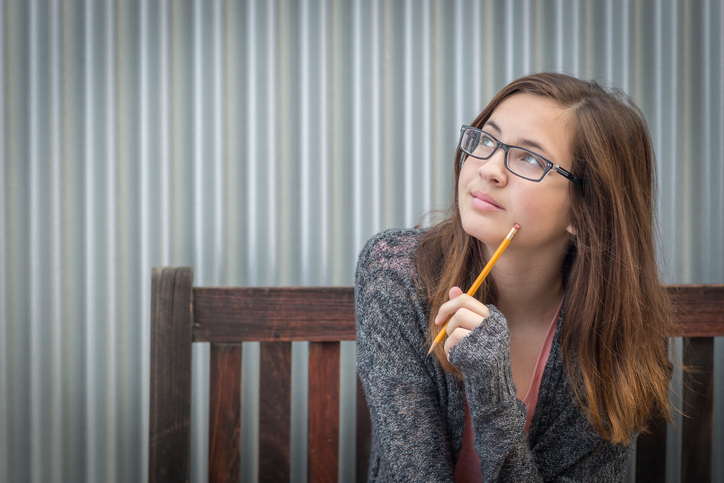 What if I have low SAT and ACT scores? If you’re not happy with your SAT or ACT scores, you have options! Most colleges will accept SAT or ACT scores from January or February test dates for regular admission, so there may still be time for one last concerted effort to boost scores. Ideally, test prep should be done over a long period of time, but a shorter and more intensive SAT or ACT prep course can still be effective. With a lot of hard work (and the right test prep program), you might be able to see a significant score increase in just a few weeks or months. If you’ve already tried everything to boost your scores but you’re still not thrilled about where you stand, consider looking into test optional or test flexible schools. A lot of really excellent colleges deemphasize SAT and ACT scores in the admissions process, and these schools are great for students with good grades but weak test scores. You’re ahead of the game because you’ve identified a weak spot with time to fix it. How well you score on the SAT or ACT the first time (or even the fifth or sixth time) simply doesn’t matter, so long as you’re willing to put in the effort to improve your scores. Test prep (when done right) is a marathon, not a sprint. The SAT and the ACT don’t test factoids that you can simply memorize the night before; they test foundational skills that take time to master. • Do you intend to apply to college early? If so, you’ll need your final test scores by October or November, so you’ll need to start test prep earlier. • Do you know which test you intend to take? Some students have a natural affinity for one test over the other while other students opt to take both tests. 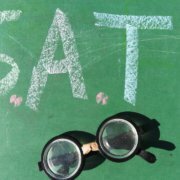 Take a diagnostic SAT and a diagnostic ACT and compare scores to see if one test might be better suited for you. • How many times are you willing to take the test? Many students benefit from taking the SAT or ACT more than once. If that sounds like you, be sure to check the available test dates to register for tests before your college applications are due. A diagnostic SAT or ACT is an important part of test prep planning. Scores from a diagnostic test will help you figure out just how much of a score increase you need and where your greatest strengths and weaknesses lie. Every C2 Education test prep program starts with a full-length diagnostic SAT or ACT. 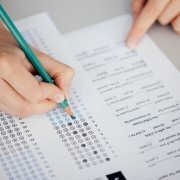 Our expert educators use the test results to help students plan an effective test prep program, and our teachers examine the results in detail to target each student’s unique strengths and weaknesses. This tailored instruction ensures efficiency, helping students to maximize test scores and build foundational skills. • Get a good test prep book (we recommend either The Official SAT Study Guide or The Official ACT Prep Guide because these books are published by the test-makers themselves). • Take a diagnostic test to see where you stand. Look at your section scores carefully to see where you need the most work. • Target your practice and review to hit those areas where you scored the lowest. • Include some practice on areas where you scored well – if you don’t use these skills, you might lose them. • Read every day. Both the SAT and the ACT require that you be able to read quickly and efficiently, and that comes only with practice. • Don’t be afraid to ask for help if you don’t understand something. • Give yourself plenty of time. When done right, test prep should take months, not weeks. Ashley joined C2 Education in 2008. Since then, she has been instrumental in developing C2 Education’s unique line of curriculum materials, helped hundreds of students through C2 Education’s college admission essay help service, and shared her expertise in the fields of education and college admissions through the C2 Education blog. https://www.c2educate.com/wp-content/uploads/sat-and-act-scores-need.jpg 483 724 C2 Education https://www.c2educate.com/wp-content/uploads/logo.png C2 Education2017-08-28 15:28:442017-11-03 17:29:01What SAT and ACT Scores Do I Need? Paying for College: You Got In. Now to Pay for It.